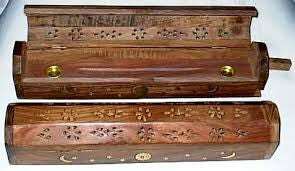 You will receive 1 coffin style wooden incense burner and 3 packages (12 Sticks) of our hand made incense. Our choice of fragrance. The photo may not be exactly the item you receive. The style will be the same but some have gold inlay stars, moons, etc. on them. The burner looks good; it arrived on time was was well packaged. The way the smoke diffuses through the holes is rather pleasing to watch. The included incense has a strong scent that lasts a long while. Arrived on time and is beautiful !